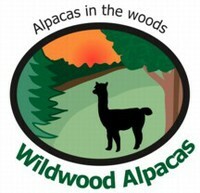 Wildwood Alpacas: Photo Album: Those Happy Crias! One of the best aspects of being an alpaca breeder is having crias! When you first start, it's a little scary but usually everything comes out just fine without human intervention. It's fun, and often a surprise, to see what color the cria is after waiting almost a year. Sometimes you have a bunch of girls, other years lots of boys. As soon as they start walking and join the herd, the real fun begins! Zooming, pronking, chasing, jumping up, chasing chickens, checking out the herdsires on the other side of the fence, etc - putting on a wonderful show! Let's go get those chickens!